Previously, I covered the must-have Disney books to give this holiday season. Now, comes some other really cool and unique Disney gifts to give to the ultimate Disney fan in your life or to put on your list this holiday season! Happy shopping. 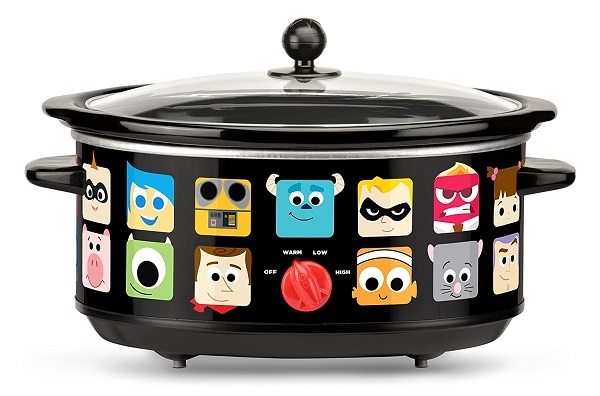 Disney Pixar Oval Slow Cooker, 7 quart, Black / $35.00*) – with a 7-quart removable stoneware insert, now you can hang out with your Pixar Pals while waiting for your stew to cook! The outside is decorated with funky, square-shaped characters including Woody, Nemo, Remy, Sulley, and others. This slow cooker also includes variable heat settings, cool-touch side handles, adjustable temperature dial, and non-skid rubber feet. 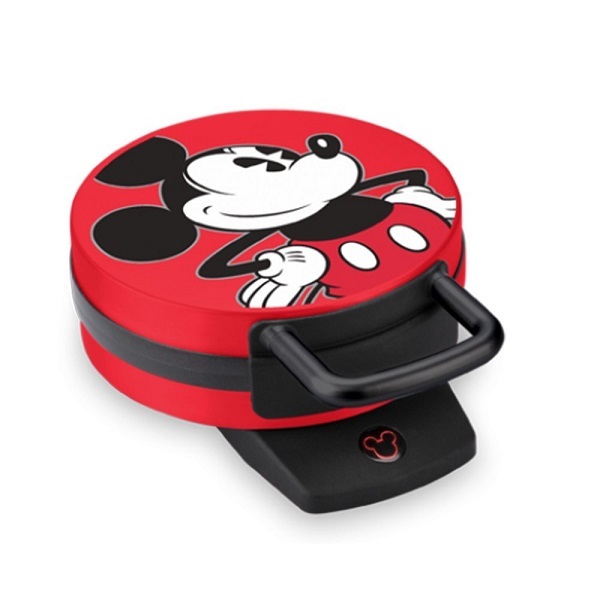 (There also is a 5-quart Mickey Mouse slower cooker that comes with a 20-ounce dipper for $51.58). Disney DCM-12 Mickey Mouse Waffle Maker, Red – although they don’t look like the Mickey Waffles found at the Disney Parks, these Mickey-shaped waffles will taste exactly like them if you use Carbon’s Golden Malted Pancake & Waffle Flour Mix, Original, 32-Ounces mix. With nonstick cooking plates, this waffle maker bakes one 6” Mickey waffle. There is also other Disney themed waffle makers including Minnie Mouse ($41.13), Darth Vader ($39.99), the Death Star ($39.99), Millennium Falcon ($39.99) and a retro shaped Walt Disney World Mickey logo waffle maker ($15.99). 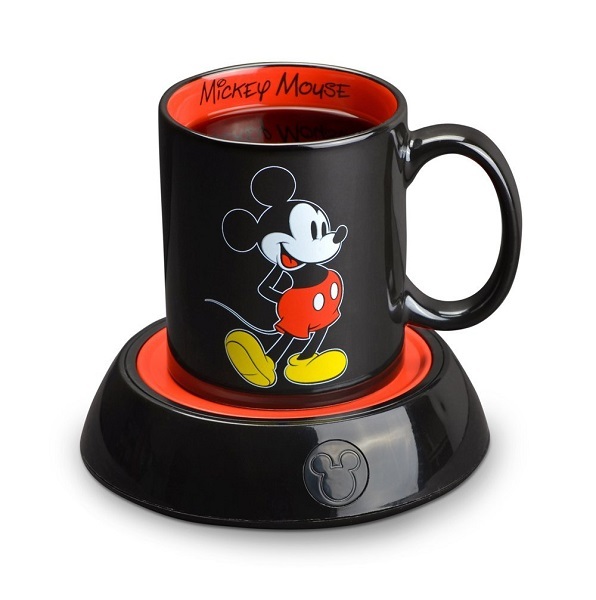 Mickey Mouse Mug Warmer (Amazon / $8.99*) – a perfect stocking stuffer, this 10-ounce ceramic mug comes with a matching heated base. A Minnie Mouse mug warner is also available ($10.39). 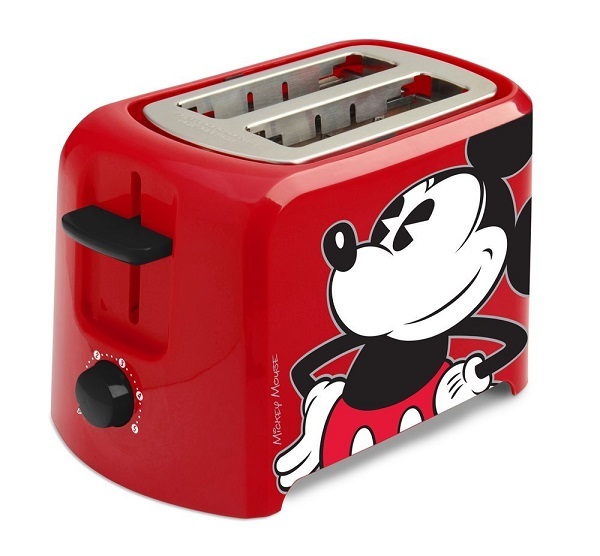 Disney DCM-21 Mickey Mouse 2 Slice Toaster, Red/Black( $14.99) – rounding out everything you need for breakfast is this red and black, 2-slice toaster with a large Mickey on either side. 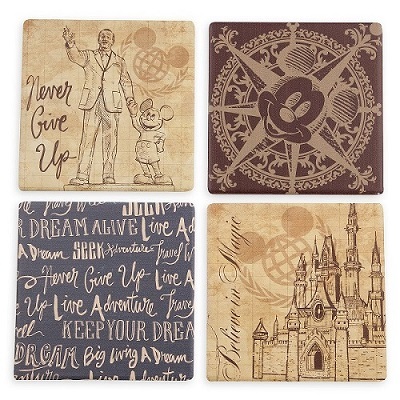 Walt Disney World Vintage Collection Coaster Set (ShopDisney/$24.95) – set of four ceramic coasters with cork bases and designed with images of the Partner’s Statue, Cinderella Castle, Mickey Compass design, and inspiration quotes. Joffrey’s Coffee (Joffrey’s Coffee/$48.99) – of course no breakfast is complete without coffee! 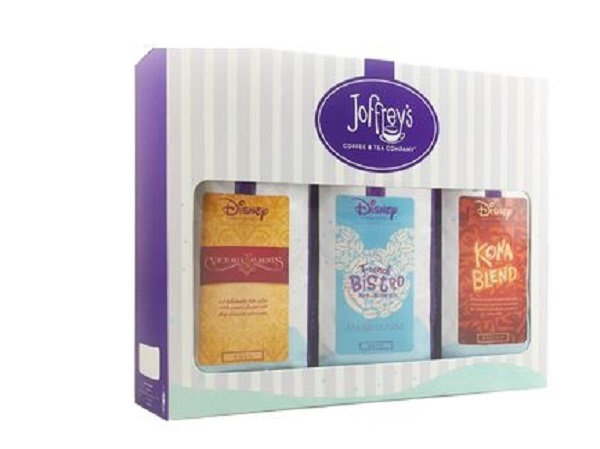 Joffrey’s Coffee, which is found in every Disney resort guest room and most on-property Disney restaurants that brings the taste of Disney right into your kitchen – the Disney Parks & Resorts Coffee Trio. This gift set, which includes three one-pound bags of ground coffee, includes a Kona Blend – found at the Polynesian Village Resort, a French Bistro blend – which is available in all guest rooms, and a Victoria & Albert blend – which is served in the award winning Victoria & Albert Restaurant at Disney’s Grand Floridian Resort & Spa. 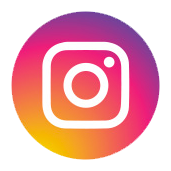 Expedition Roasters (Expedition Roasters/$11.00) – is a craft roaster that focuses on small batch themed coffees. Focusing on quality coffee, art, and story, Expedition Roasters offers some unique specialty blends like The Happiest Brew That Ever Sailed, Main Street U.S.A. Columbian, Ghoulish Delight, and Redhead Rum. 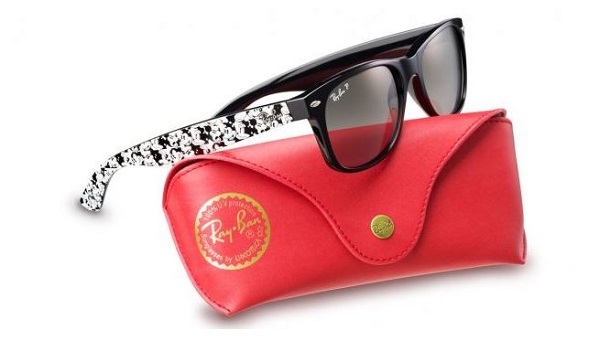 Mickey Mouse Ray-Ban Sunglasses (Walt Disney World/Disneyland Resorts – $243.00) – Introduced last year and back by popular demand, Ray-Ban brings back these limited edition sunglasses with a new look. This year’s sunglasses feature polarized grey gradient lenses with a classic black and white Mickey Mouse pattern on the arms. Since quantities are limited there is a five-pair purchase limit. At Walt Disney World, the sunglasses are available at the Sunglass Icon at Disney Springs and the Island Supply by Sunglass Hut at Magic Kingdom Park. Over at Disneyland, they are available at the Sunglass Icon at Downtown Disney District and the Disney California Adventure Kiosk. 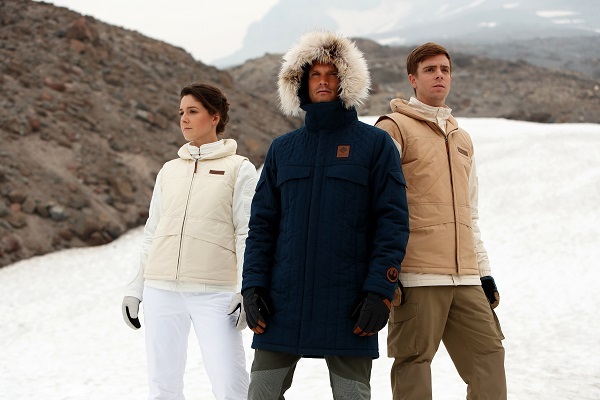 Star Wars-inspired Outerwear (Columbia Sportswear and select Columbia branded retail locations – $400.00) – beginning December 8th, Star Wars fans will be able to brave the cold weather like Han Solo, Princess Leia, and Luke Skywalker with these limited-edition, Columbia Sportswear jackets. The collection is named after the Rebel’s secret base on ice planet Hoth. Leia Organa™ Echo Base Jacket jacket and vest combination, with a stowable hood, is crafted of a durable, water-resistant, cotton-blend fabric and insulated with Omni-Heat™ Reflective lining. The Luke Skywalker™ Echo Base Jacketis a cotton-blend, water-resistant jacket and vest combination with a stowable hood is inspired by Luke’s original Hoth costume in Star Wars: The Empire Strikes Back and features Omni-Heat™ Reflective insulation to conserve body heat. The Han Solo™ Echo Base Parka is crafted of a durable water-resistant, cotton-blend fabric and insulated with Omni-Heat™ Reflective lining. The jacket features multiple closures, a leather Rebel patch, and quilted faux-fur trimmed hood. 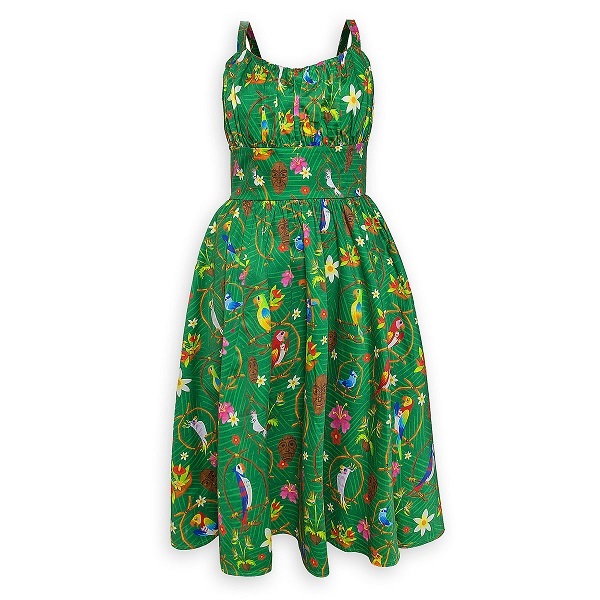 Enchanted Tiki Room Sundress (ShopDisney/$118.00) – Inspired by Enchanted Tiki Room attraction, this fun and colorful dress features birds, tiki gods, and tropical flowers on a green cotton/spandex dress. 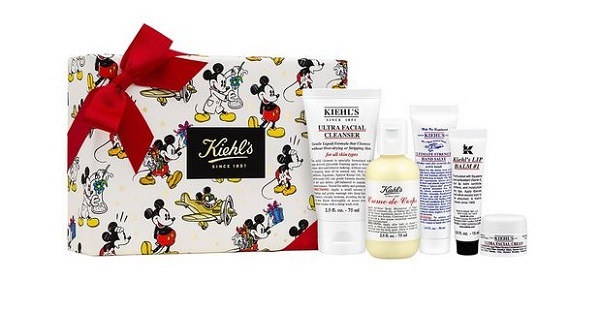 Disney x Kiehl’s (Kiehl’s/Prices vary) – Disney has teamed up with Kiehl’s to offer some of their most popular men’s and woman’s skin care products packaged in classic Mickey graphics for the holiday season. When select items are purchased, such as the Skin Hydration Essentials kit (above), 100% of the net profits will go towards Feeding America, on behalf of local member food banks. It’s a gift that gives twice! 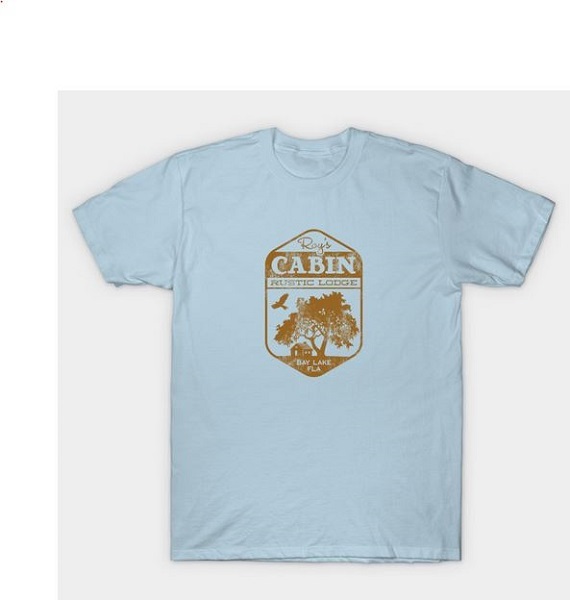 RetroWDW (RetroWDW/Prices vary) – whether you want adult or kids apparel, something for the home or for your tech toys, the guys who host a great Disney history podcast, RetroWDW, has some great designs that any Disney fan will know and love. Rob Yeo Design Pins (RobYeoDesign/Prices vary) – UK based graphic designer and Disney fan, Rob Yeo, has some great interpretations of Disney classics and fan favorites. This year he’s created two sets of pins, based on his childhood memories of Walt Disney World’s Future World (circa 1996) and Disney/MGM Studios (circa 1998). 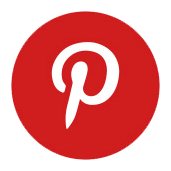 Disney Poster Art (Buchworks/Prices vary) – there are a lot of artists on Etsy who create Disney art. 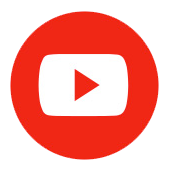 Some of it is great and some of it is … well. 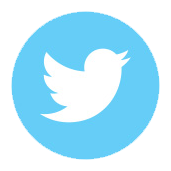 One of those who does great work is Christopher Buchholz. One of my favorites is his Walt Disney World Resort Transportation and Main Street U.S.A. graphic posters. 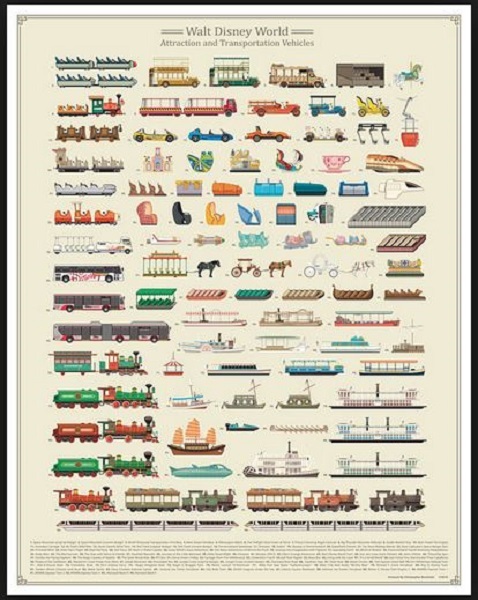 Each of these posters meticulously 92 past and present attraction and transportation vehicles and all 52 buildings on Main Street U.S.A. For the Disneyland fan, Christopher also has a Disneyland Resort Transportation print. 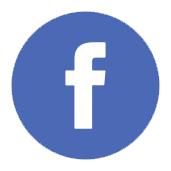 * prices quoted are at the time of publication. actual online prices may vary.